Mini trip report! Read all the posts in this report here. 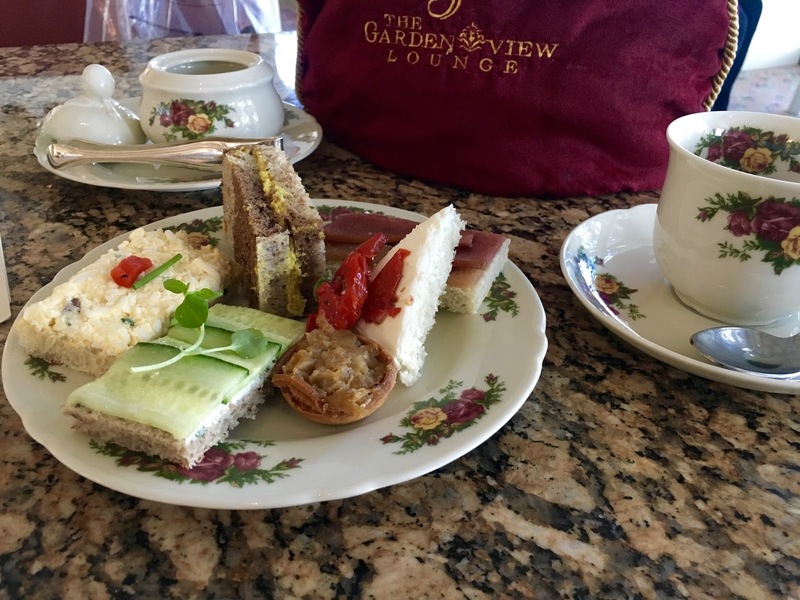 We finish out my WDW Marathon trip report with a review of afternoon tea in the Garden View Lounge. I have probably had afternoon tea at the Grand Floridian than I have had any other WDW experience. Off the top of my head I've done it at least six times, although admittedly not since 2013. Naturally many changes may occur in the space of that many years, but that's not I made my ADR for one the day before the marathon. No, I made it because a giant pot of tea and baked goods sounded like a fabulous way to hydrate and carb up for a long run. 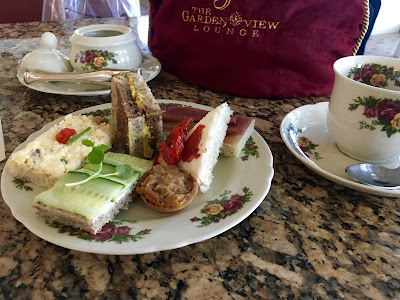 For those unfamiliar, afternoon tea takes place in the Garden View lounge on the main lobby floor of the Grand Floridian. The views are not astounding and the room is open to the sometimes chattery lobby next door, but it's a pleasant enough setting. I do wish the tables weren't so close together, but what can ya do. There is always a long list of teas available, and while you can make a la carte food purchases it's much more efficient to purchase a set tea menu. This can range from tea sandwiches and pastries to a full cheese plate spread and champagne to top things off. I say it's more efficient; I do not say it's a good value, at least on the face of things. I swear I remember getting one of the fancier teas for $35 as recently as 5 years ago, the one that included a glass of champagne. Well, no more; the standard tea spread itself is now $35, and you'll need to rocket up to $50 if you want that glass of bubbly. Ah well. We do not go to Disney because we feel that it's a bargain, no? I ordered the cheapest, basic $35 Bedfordshire spread with, after some deliberation, the caramel rooibos tea (normally I get cassis but I wanted something herbal so it wouldn't be dehydrating). The tea came out first; my server poured my first cup, then ensconced the teapot in a tea cozy. The caramel rooibos had a rich flavor that was enhanced by the addition of sugar cubes from a little sugar bowl, tongs and all. The first course was the finger sandwiches. Interestingly enough, every online menu I've consulted says they are accompanied by berries and cheese, but I don't remember seeing that and I definitely didn't get any. Once my sandwiches were done my server brought out my final two courses, which is interesting because they were formally delivered separately, in true course style. Admittedly that little tier thingee is neat, but it does take away some of the luxuriousness of a drawn out experience, if that makes any sense. Anyway, I started with course two, the jam tart and scone with accompaniments. The jam tart is basically shortbread with some thick raspberry jelly in the middle. It reminds me of a very high end Pop Tart. Can I get some frosting up in here? The scone is freakin' delicious - it's got currants in it, which are like raisins but not and that's a little weird, but the scone itself is soft and buttery, like a biscuit but without the crusty elements. I'm way into it. Accompaniments have changed a lot over the years. This time around there was apricot jam (eh), butter (good but could've been softer), and the most recent addition, lemon curd. I have no idea why the last one exists because I don't think it does much for the scone itself, but I will sure as hell eat it with a spoon. The one tragic loss is the Devonshire cream, which was like butter RIGHT before it becomes butter and it is DELICIOUS. But apparently some people didn't like it, because it peaced out. :( Please come back, Devonshire cream! For the dessert course, in the Bedfordshire tea, you have three choices: trifle, strawberries and whipped cream, or a selection of pastries. For years the trifle was ALWAYS strawberry, but a couple years ago they started to do seasonal flavors. This time around it was blueberry-lemon, but I don't like blueberries so pass on that. On rare occasions strawberries don't agree with me, so pastries it was. Back in the day you got to choose a couple from a tray, but that's changed too; now you get what they give you. Normally one of those things is a chocolate covered strawberry, but see above note about strawberries. My server was kind enough to double up on the pastry swans. Those pastry swans were excellent - the choux pastry or whatever that made of the swans didn't have a ton of flavor, but the mousse was something nutty... I want to say hazelnut? Very light but with an assertive flavor. The macarons were just that - macarons - good, nothing special. Looking around I saw flavors other than what I had, so that seems randomized. All the while, I sipped my tea and read a book and messed around on my phone and relaxed, and that was fantastic. I would highly recommend this experience to anyone wants a light but filling lunch where you can chill. Just come prepared to drop a little money. I think I might do this again before next year's marathon. Who's in? I want to do the tea again! I think 2014 was the last time I was there for it. You definitely should - I wish the price hasn’t gone up so much but it’s definitely still a great experience! I'm a Brit. I know afternoon tea. If there's no cream - that's NOT afternoon tea! I don't know one person who puts butter on their scone! The Devonshire cream was SO. MUCH. BETTER. And the jam used to be strawberry - this is the first time I've gotten apricot. It wasn't that good. :/ Killer scone, though!